OKEON Chura-mori Project: what is it? Simply put, it is an environmental monitoring project in Okinawa, Japan, funded by OIST, and conducted through the co-operation of Okinawan local society. From researching the biodiversity in Okinawa to developing social networks and improving environmental education, the goals of the project include multiple aspects. This video will introduce the insect monitoring aspect of the field sampling system. 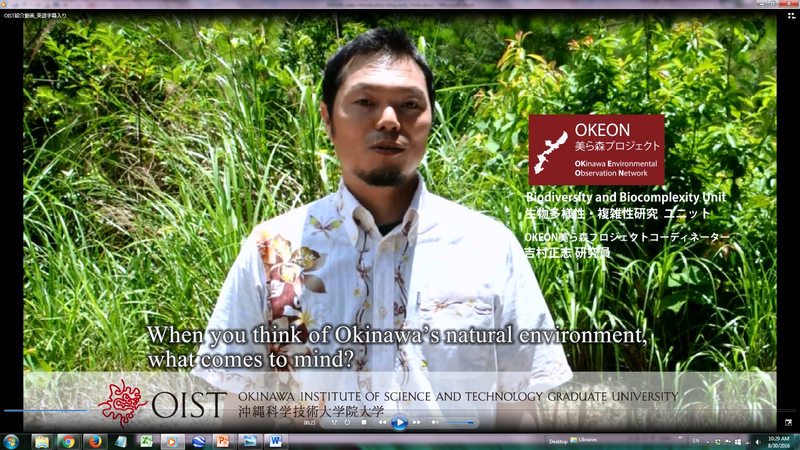 The primary scientific goal of OKEON is to measure and monitor the terrestrial environments of Okinawa and understand how natural and anthropogenic factors affect the environment over time. One component of this is to use samples of small insects, collected from SLAM traps. On each of the 24 sites across Okinawa, there are also instruments which log weather data, camera traps and acoustic recorders. There are many activities besides this which are fundamental to OKEON. There is collaboration with museums, high schools and universities across Okinawa. For example, students at Hentona High School collect materials from OKEON sites which can be used for their education and for research at OIST. These students are taught to do so by high school teachers who have attended a training programme at OIST related to ant research. Projects like this which create benefit for everyone involved and have a positive impact on society are very important to OKEON. We hope you enjoy the website, where we will post the latest information and blogs. Please also visit our Facebook/Twitter page for further updates. Please see below for the Japanese version of this blogpost.